Do you find yourself at the office with a stack of papers to sort? Don’t risk a paper cut. A homemade rubber band thimble is easy to create, will protect from nicks, and will help you sort sheets with ease. 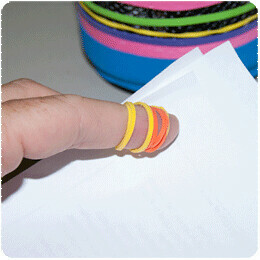 Simply wrap a rubber band around your index finger. You’ll have an instant “thimble.” With that extra grip, you'll fly through stacks of paper, magazines, and books. Tell us how rubber bands hold things together in your world. We’d like to thank Kim, the winner of our latest blog post. She receives a prize pack and t-shirt. Our website will be undergoing updates through the next few weeks. Your patience through delays is appreciated. We will be back on schedule soon. Thank you for being here with us.